The decline in real interest rates over the past several decades has been the subject of intense policy debate. This column argues that, with the current demographic profile of large older cohorts leading to a population that is disproportionately biased towards saving, we can expect real interest rates to remain low or negative for another 10 to 15 years. The only way for the Eurozone, in particular, to accommodate these excess savings may be to raise its sovereign debt levels. How long can we expect the low full employment real interest rate to persist? In the meantime, what is the proper policy response? Can monetary policy deal with the problem, or should fiscal policy step in? In a new CEPR Policy Insight, we argue that due to demography, there are good reasons to expect real interest rates to remain low or negative for the next 15 years, in particular in the Eurozone (Lu and Teulings 2016). Figure 1 shows the age pyramids for the four largest economies in 2014. 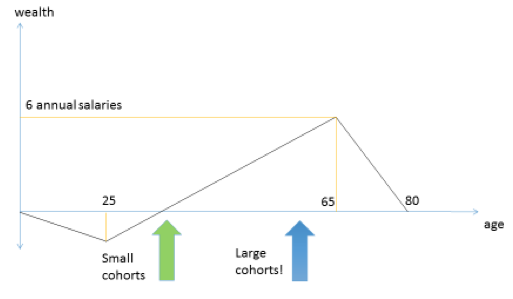 Apart from the US, where cohort size is relatively constant for those under the age of 60, there is a clear pattern of demographic imbalance where the size of the cohorts approaching retirement far exceeds the size of the young cohorts. The cause of this imbalance is the introduction of the contraceptive pill (Goldin and Katz 2002). The effect is particularly marked in Germany, where the fertility rate fell from 2.5 in 1967 to 1.4 in 1970. In the long run, this will lead to a decline of the steady state population growth from 1.5% to -0.5% per year. However, during the transition to the new steady state, the age composition of the population will deviate strongly from its steady state structure. The fall in fertility led to substantially smaller cohorts born just after the introduction of the pill, with an echo-effect when the first, smaller, post-pill cohort of women starts giving birth themselves. The last cohorts born before the introduction of the pill are therefore much larger than the cohorts born before and after. For Germany, the cohort born in 1995 is just half the size of that born in 1968. The demographic imbalance described above has important implications for the FERIR. Consider the life cycle model of savings and consumption. People initially borrow to finance their education; next they enter the labour force and begin saving, at first to repay this loan and then to save for retirement; finally they deplete these savings during retirement. For this reason, the desired stock of assets is at its maximum just before retirement. The current demographic profile, with large cohorts approaching retirement, means that the population is disproportionately biased towards saving. As the large cohort desires to hold a large stock of savings, there is a surplus of savings. At the same time, the absorbers of savings – the young cohorts who borrow to finance their education – are in short supply. This implies that the real interest rate will be low, in fact even negative. Figure 3 shows our calculation for the response of the real interest rate to the sudden decline in fertility. This presumes each individual to live for 75 years, where they begin working at age 20 and retire at age 65. Women give birth between the ages of 18 and 28. Consistent with the data for Germany, the fertility rate falls from 2.5 to 1.4 around 1970. We account for 1% TFP growth. Following the shock, there is a transition period of many decades where the real interest adjusts from the initial level of 2% to the terminal level of -0.5%; both values are consistent with the Golden Rule, where the growth rate of the economy is equal to the return to capital. The interesting part of this graph is the transition path. We find after a short initial increase, there is a sharp fall in the real interest rate by some 4%. It reaches a trough that is negative around the year 2035, after which the real interest rate begins to recover. This fall is caused by the savings of the large cohort. Once this large cohort enters the labour market in the 1980s, they become net savers, and simultaneously the real interest rate begins its descent. As they accumulate assets for retirement, the real interest rate continues to fall. 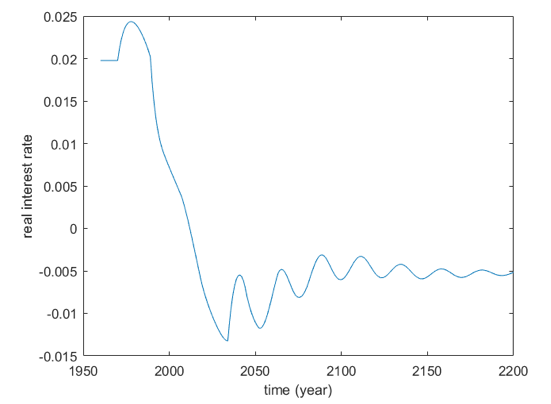 This fall reaches its trough around 2035, at which time the desired stock of savings in the population is at its maximum. After this, the large cohort begins to deplete their assets and as such the real interest begins its recovery. Note that the fall in real interest rates from 1980 to 2035 overshoots the level of the new balanced growth path. Demography implies that our current situation of negative interest rates will persist for another 15 to 20 years. This period of excess savings may lead to bubbles, which arise to provide an additional store of value when assets are relatively scarce. Bubbles can lead to financial instability, however, hence it is an imperfect solution to the problem of excess savings. Sovereign debt should increase to avoid bubbles as sovereign debt is a substitute asset to bubbles, but in Europe this runs counter to the Stability Pact. In this regard, we should look to Japan’s economic experience since the early 1990s. 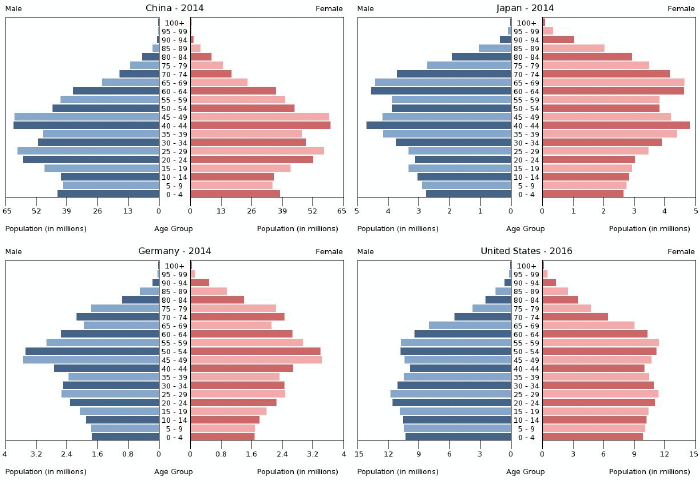 As Figure 1 shows, the demography of Japan leads that of Europe by 15 years. Likewise, we see that Japan’s real interest rate has been low since 1990. After the collapse of its real estate bubble in 1990, Japan could only cope with its excess savings by increasing its sovereign debt. For the same reason, one would expect the Eurozone to be forced to raise its sovereign debt level so as to accommodate these savings. Authors’ note: See our CEPR Policy Insight No. 86 piece for a further discussion of these issues. Bean, C, C Broda, T Ito and R Kroszner (2015), Low for Long? Causes and Consequences of Persistently Low Interest Rates, Geneva Reports on the World Economy 17, ICMB and CEPR. Goldin, C and L F Katz (2002), "The power of the pill: Oral contraceptives and women's career and marriage decisions", Journal of Political Economy 110(4): 730-770. Lu, J and C Teulings (2016), "Secular stagnation, bubbles, fiscal policy, and the introduction of the pill", CEPR Policy Insight No 86. Teulings C, and R Baldwin (2014), Secular stagnation: facts, causes and cures, London: CEPR Press.